Good morning friends!! Brenda here with you. 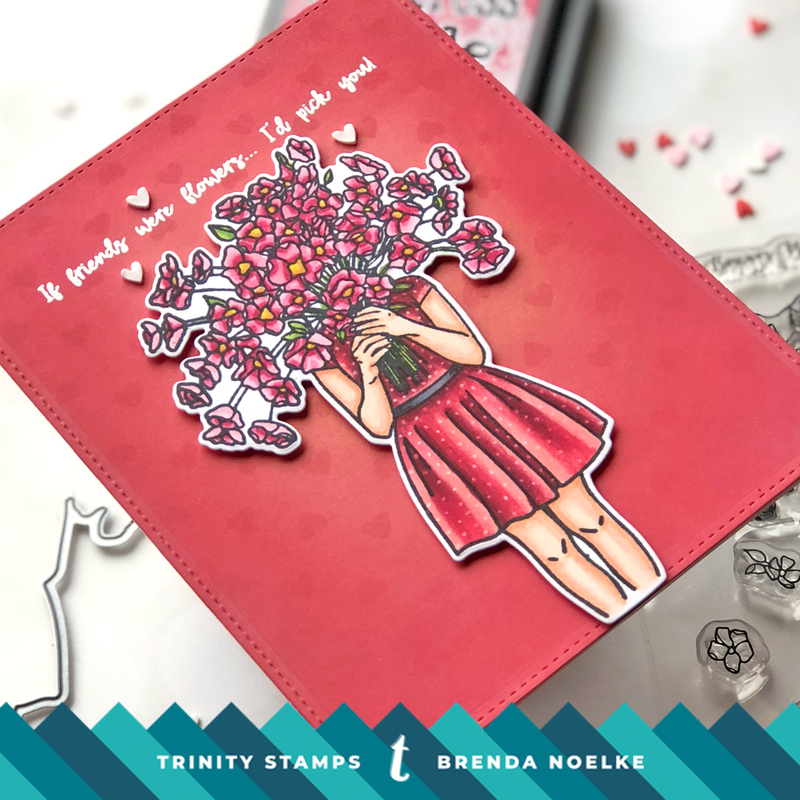 Do you send cards to your female friends on Valentine’s Day? 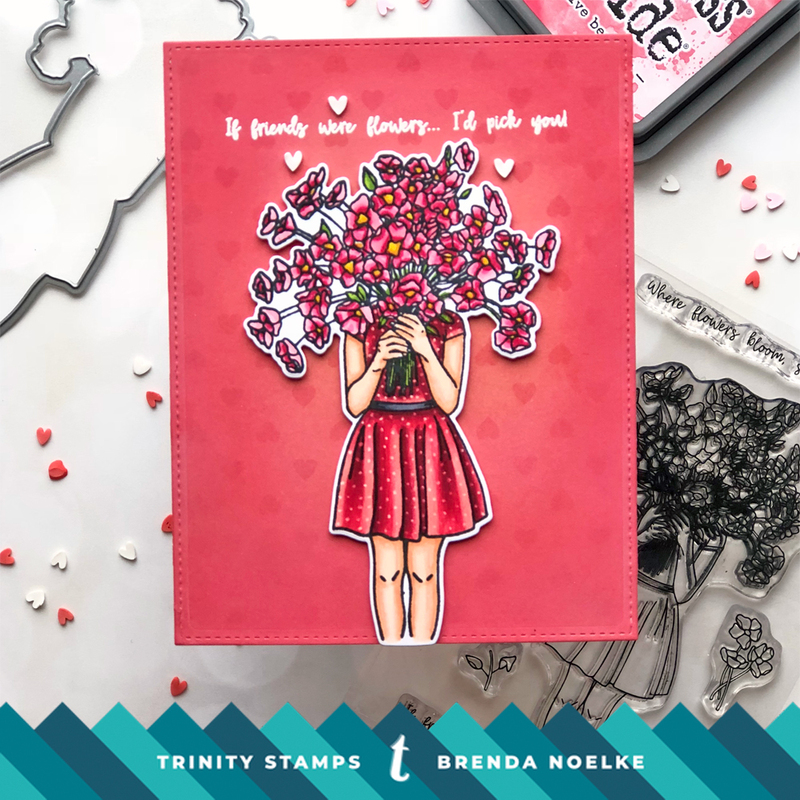 The Bouquet of Hope stamp set is perfect for creating a “Galentine’s” Day card!! I started by stamping the Bouquet of Hope image onto white cardstock with Momento Tuxedo Black Ink. I colored it with Copics and then cut it out with the Coordinating Die. I found a scrap piece of patterned paper in my stash that was perfect for the background panel! I die-cut the panel with a stitched rectangle die and pulled out my Blendability Brushes. I used Festive Berries and Picked Raspberry Distress Oxides with the Blendability Brushes to blend around the outside of the panel. These brushes create the smoothest blend!! After the panel was completely dry, the sentiment (also from Bouquet of Hope) was white heat embossed directly onto it. The girl with the bouquet was adhered with foam adhesive. A few Creamy Vanilla Heart Sprinkles were added around the sentiment. Did you see all of the colors available in these hearts??? Check them out here. I NEED them all!! I also added some polka dots to her dress with a white gel pen and called it done!! I think this is the perfect way to let a friend know that you’re thinking of her on Valentine’s Day!! Have a great weekend and I’ll see you next Thursday!! This is a beautiful stamp and I bought it because Kelly Latevola showcased it in a card she made months ago. I colored it in purple because it is my favorite color. Now I see it in fabulous red! This is darling and will be perfect in red for next week’s holiday! What a beautiful card and thank you so much for sharing it! 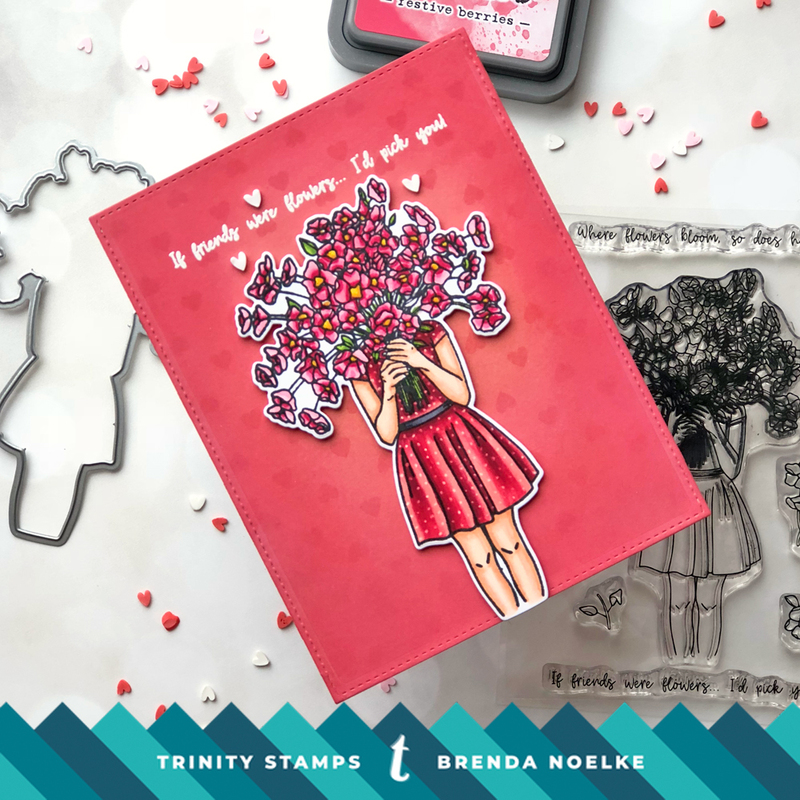 Love this stamp and this card by Brenda!!! !